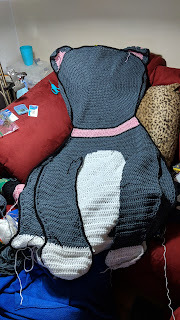 I made all the parts for the cat afghan and meant to sew them on this weekend so I went ahead with the next rotation piece. Timing didn't work out for the cat as I was out most of Saturday and today was just not in the mood to work on it. Next days off I'll sew it together. 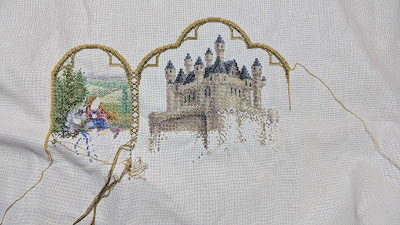 In the meantime, I hope to manage a page finish on the Triptych before all the beige drives me nuts. Started a shaped afghan. I need to outline one of the legs, sew both down, then make the eyes, nose, heart, bow, and tail and sew those to it along with mouth a whiskers. Oh and here's the finished page of Black Stallion. Cameras hate the color for some reason. It never shows up right. 83/98 rows complete. The entire first row is going to look like this. I think you can kind of tell there are 4 main colors on this page. 155 and 340 are so close together I had to be careful when working on the rows where they overlapped. No new stash this week. I was good. So I leave you with Clyde. 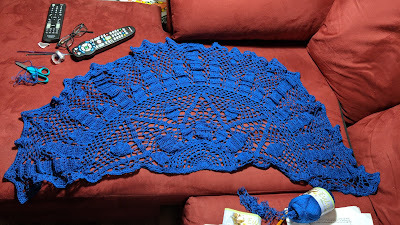 So I finished the shawl with minimal visits from the frog. Still needs blocking. And so I started on The Black Stallion. I had only 17 rows done on the page, now I'm at 40. With the exception of 3 stitches, it's all 2 colors. I also caved to HAED's sale. The first one is now retired and I bought the hard copy. 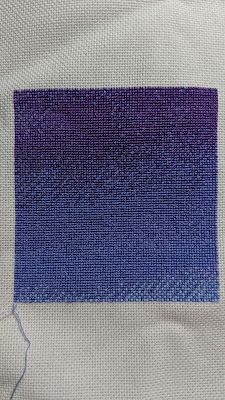 Just in case I ever decide I really don't ever want to stitch it.